The second arc of our bestselling Season Eight starts here. Top creator Brian K. Vaughan (Y: The Last Man; Pride of Baghdad; Lost) takes over writing duties and dives headlong into what Faith is up to-infiltration, assassination, and nonstop Cleveland. The fugitive Slayer is given the assignment that could change her life . . . if Giles's specialized training doesn't make her want to end it first. 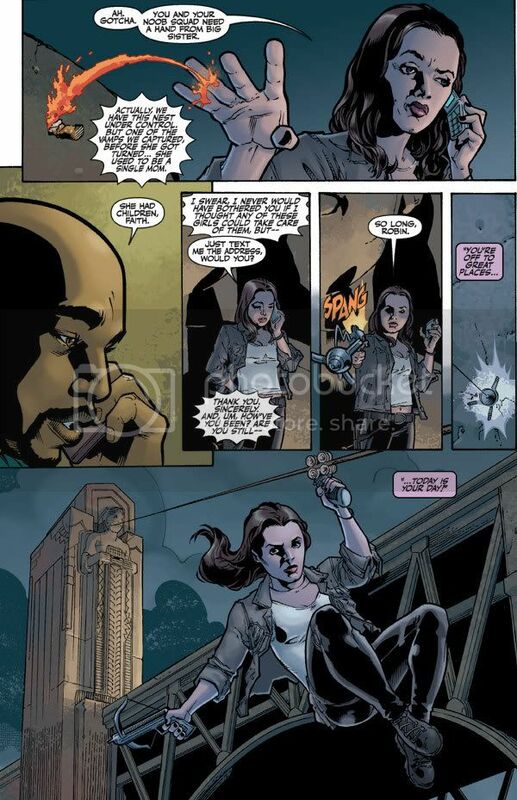 Artist Georges Jeanty (The American Way) remains at the top of his game--and Joss Whedon stays on as Executive Producer--in this first part of "No Future for You." I REALLY can't wait to see Faith again! I'm excited to see Brian K. Vaughn's take on her. 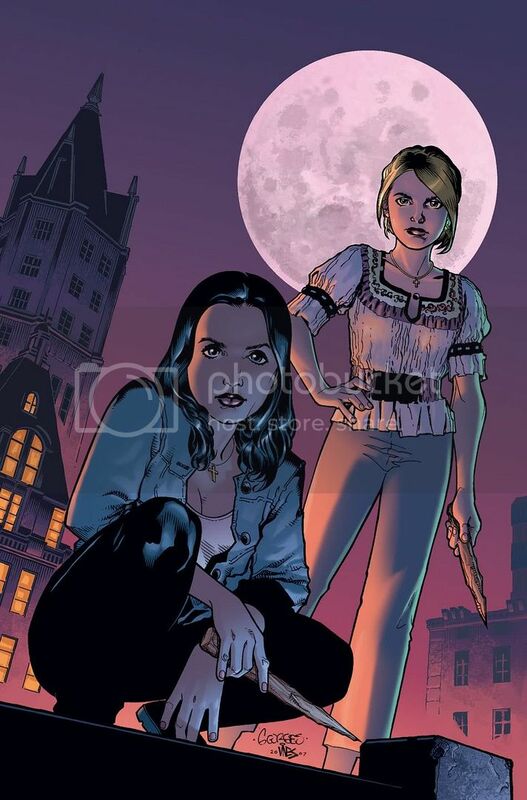 I'm also happy Giles will be playing a bigger part and that we will still see Buffy and hopefully the gang. It's gunna be hard waiting till September. Some more details have turned up about Brian K. Vaughan's upcoming "Faith" Arc. A recent interview with Buffy cover artist Jo Chen in the offical BtVs/Angel Magazine which ends this month, revealed that the arc will feature Faith taking her own father to the 'Enchantment Under the Sea' dance during a trip to 1955, which promises to elate readers. Also, for anyone whose waiting for the upcoming Serenity mini-series, here's some tidbits: The premise will focus on the Serenity crew aquiring a job so lucrative that it will let the entire crew retire. The pressure of pulling of a job with such high stakes begns to wear away the team, and they slowly begin to break apart as the storyline progresses. Wow what an interesting story for Faith. We never really heard about her real father. I always assumed he either bailed out on her, or died. 1950's Faith! What is she gets stuck in the past?! Great reference to Back to the Future. I guess we'll know when we'll know, right? I love the idea of Faith dealing witha rogue slayer who turned to the dark side, much like she did. That's a great redemption story for her. It's like she's paying forward what Angel did for her. I think it'll be fun to see her as a fish out of water in high society. Too bad we can't see how Eliza would have played it in a TV episode. Written by Brian K. Vaughan, penciled by Georges Jeanty, inked by Andy Owens, colored by Dave Stewart, cover by Jo Chen. The second arc of Season Eight starts here. Brian K. Vaughan takes over writing duties and dives headlong into what Faith is up to -- infiltration, assassination, and nonstop Cleveland. The fugitive Slayer is given the assignment that could change her life . . . if Giles's specialized training doesn't make her want to end it first. 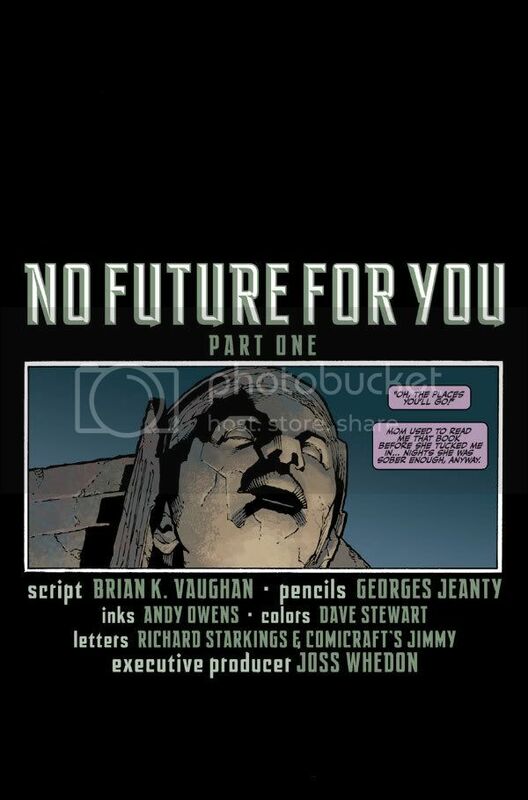 Joss Whedon stays on as Executive Producer in this first part of "No Future for You." 40 pages, $2.99, in stores on Sept. 8. Ah! I can't take it! "No Future For You". 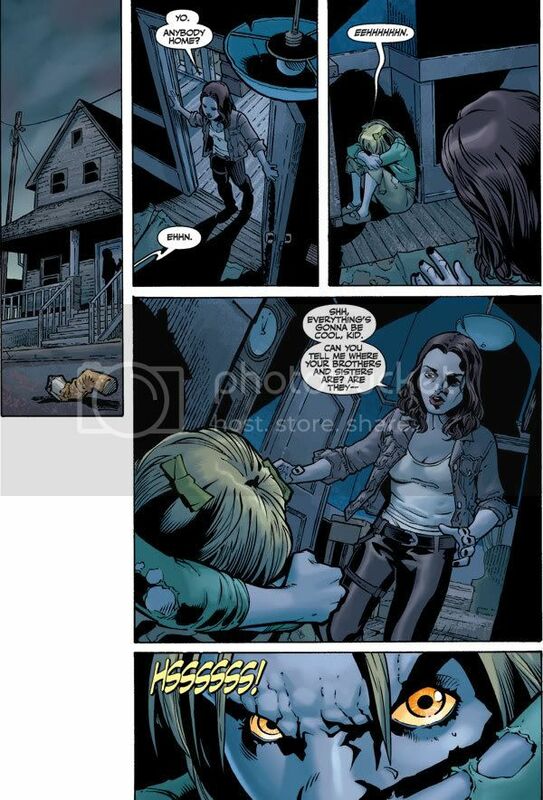 So Giles is with Faith...in Cleveland...I hope she doesn't get killed off I think that would send me over the edge lol. I love how this is the second issue in a row with 40 pages. Ooh, love the variant cover! So excited for this arc! 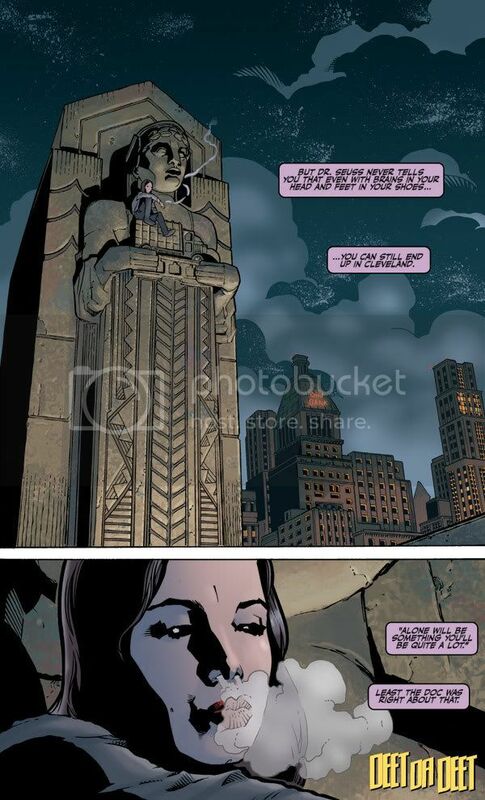 I think it's funny how Joss is sending Vaughan's characters back in time and in turn he's doing the same with Joss's! Ok, so I was just going to mark September 8th on my calendar, but that's a Saturday. 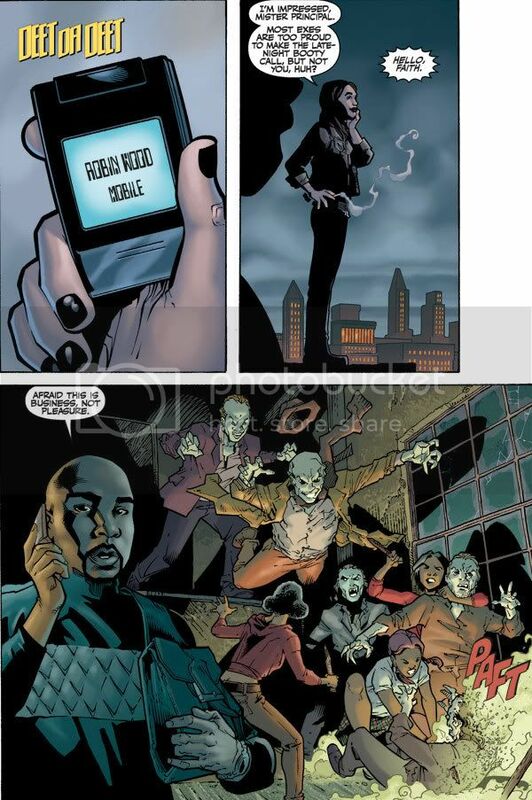 Could Dark Horse have made a mistake? I mean, it's near Labor Day but would that mean it would come out on a Saturday? Yay! Jo Chen added the tattoo! That always bothered me. I hadn't noticed! That's awesome, though. Don;t kill me, but the variant kind of looks fat. Fat Faith, Fat face. Anyone agree. 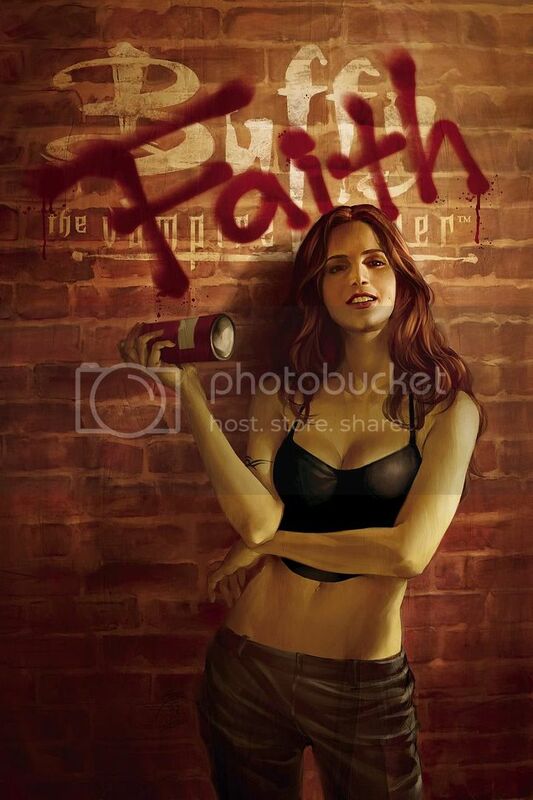 Actually I don't think the variant cover looks like Faith at all. Is that one the Georges cover? Anyone know? If it is, I still don't see his amazing likeness and stuff that has been praised on other boards and sites. Georges' sig is on it under Faith's knee. What happened to his wonderful art? I think the cover is a very good likeness. But I guess its all in the eye of the beholder. She doesn't look fat to me though. Maybe its muscles. by u saying "muscles", i think u think we're talking about the cover with only her. We're talking about the one with her and Buffy. The variant. If that's fat to you, you're not very realistic about a woman's body. Personally, I think the one where she's standing alone looks kind of sickly. Amen! It's kind of saddening to me that considering how pro-women Joss is, like 99% of the women in the Buffyverse are all thin and model-like. It's really [censored! ]ed up that Amber Benson was the "chubby one". I thought about that earlier. As progressive as the show was and Joss is even now, we saw very little in the range of normal looking people. We also didn't exactly see a lot of ethnic diversity. 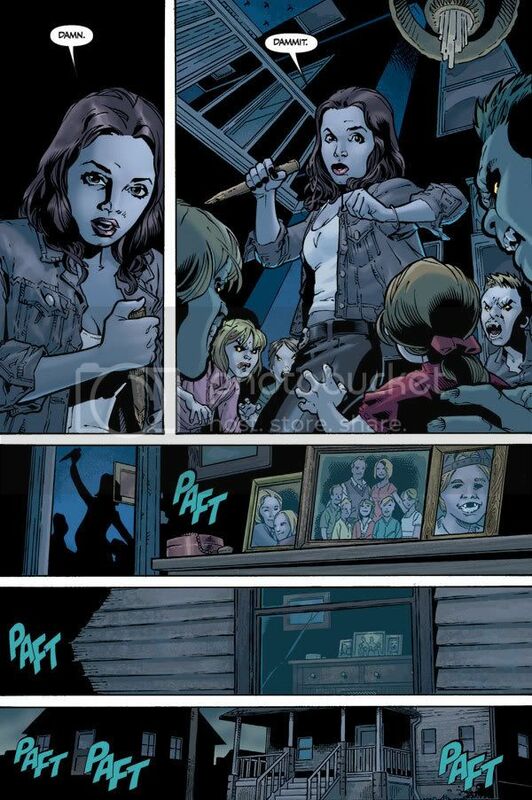 I can't think of a major character in Buffy other than maybe Principle Wood, Kendra, and Riley's friend whose name escapes me (not counting Gunn, as he was on Angel) that was any color other than white. Although I don't think that was a racist thing, it doesn't seem to reflect the population of California (or most other US cities) in population percentages. If it had been an accurate representation, at least one major cast member would at least know someone Hispanic. It has, however, been scientifically proven that we tend to gravitate toward people similar to ourselves (whether that's cultural or psychological is debatable) so this could just be a representation of the world as Buffy would recall it.